TECHIEGEMS (copyright by Carolyn Rhodes): Smart Watch or a Wireless Activity Wristband? . Smart Watch or a Wireless Activity Wristband? . A word of advice is that you MUST read what devices, (tablets, notebooks, computer, smart phone) it syncs with. This includes operating systems and later models of most Androids and Apple. (Go to www.fitbit.com/devices). You can use a dongle and sync to your computer, but the real beauty of it all is using bluetooth - where it sinks to your phone or tablet. Often you will miss the fine print so, pay close attention. Can your devices communicate with each other? I did not go out on Thursday night or Black Friday, but, I got a little ahead of the game by keeping up with daily deals from Best Buy and Google. The Monday before Best Buy sent an email with a one day sale -- which my son immediately forwarded to me -- i was the new Fitbit Charge -- on sale for $99, regular price: $129 ! It has all the features I needed and after a check to make sure it worked for me, I ordered it right away. This was an online deal only. Caller ID (if you get a call, it vibrates. Charging cable and wireless dongle. I walked up two flights and 1 1/2 miles, burned some calories on new "Just Dance" for X box and learned how to sync up bluetooth to my google tablet, computer and smart phone, which I made sure I had the latest operating system to use the activity tracker without a hitch. Good to consult your family members and friends who may be able to work with you on getting started. A pleasant sounding alarm with vibration was hardly intrusive and I woke up without jumping up today, Sunday. I charged it up this morning. Found the online manual too. There's a lot more I'll be adding to my daily routine, like how many calories I've taken in. and it's quite full of informative tips. Who is in a hurry? Start someplace and become an expert as you keep up your healthy lifestyle. 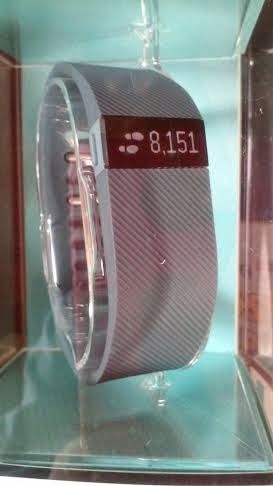 Fitbit is one of many Activity Wristbands. Some others companies include Pebble, Misfit, Jawbone. Check them all out -- each has good reviews and many are now offering some fine jewelry alternatives to fit your latest outfit. Working flawlessly. Using the calorie tracker and working out .. now with Just Dance 2015. Sleep is a accurate. Alarm works , notifications, A-OK.. we're getting along fine . OK, I'm on with my friend, Joan .. we're sure to do a lot more work outs . If you prefer a watch which you can talk to with touch screen capability where you do voice texting, answsring calls and so many other things, this might be the gift you'll be looking for. Now, these watches can cost anyplace from $79 to $500, maybe higher -- here's a website to check out a techie's dream watch. Many of these watches are on sale now as they get ready for the next models -- coming up for 2015. These look like they deliver so why wait until 2015? Nicely done, Carolyn and Casey!! Good amount of research. The techie expert and writing guru make a dynamite team with super informative article. Thank you!